Atiku Abubakar, presidential candidate of the Peoples Democratic Party (PDP), has described the Nigerian National Petroleum Corporation (NNPC) as a "mafia organisation", vowing to privatise it if elected. "Let me go back to my experience. When we got into office, I walked up to my boss and said "Sir, there are two mafia organisations in government: one is the Nigerian National Petroleum Corporation (NNPC) while the other one is the National Electricity Power Authority (NEPA)," he said. "I said unless we dismantle these mafia organisations, we cannot make progress. Let's privatise them... the long and short of this is that I am committed to privitaisation as I have said. I swear even if they are going to kill me, I will do it (privatise NNPC)." "I asked a Nigerian professor based in America; I said 'Prof, do you have ministry of petroleum in America?' He said no," he said. "I said, 'Do you have an organisation like NNPC over there?' He said no. And America produces oil more than any country? He said yes. "So I asked him, 'How do they do it in America?' and he said taxation and I decided that I will go by taxation too." 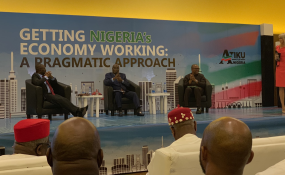 Joined by Peter Obi, his running mate, Atiku fielded questions that ranged from the economy to security, health and unemployment."